Sumith Harshan is the Web Engineer Specializes in Java Script, JQuery, HTML4/5, CSS2/3, PHP, CodeIgniter, CakePHP, J2SE, J2EE, XML, Hacking & Security, Mobile Interface Developing, Magento, Wordpress, Joomla, Drupal,PHPBB,Facebook App Developing and Open cart...etc. How to save youtube or vimeo thumbnail as featured image of wordpress post.For a examaple if you add the video url as custom meta data or post content you need to get it’s video thumbnail and save it as featured image automatically. This post is discussing how to save youtube vimeo thumbnail as featured image in wordpress post or page or custom post types. If you’re familiar with wordpress coupon site you may had use the wordpress clipper theme as parent theme.Also discounty theme is a child another theme use with clipper theme.So when we’re customize the theme you want to get store url using coupon ID/post ID.This post is showing how to get easily store url using post ID. Today I’m going to show how to remotely publish post using xml-rpc of the wordpress.This is actually very simple and powerful.If you want to publish posts or pages without log into the wordpress admin panel you can use this method.First we’ll consider what is this XML-RPC and it’s usages. This publish is describing the way to export contents as text file/txt file utilizing php.This could be very straightforward to export content material as textual content file.You can download the textual content file too. If you’re developing own wordpress plugin may be you have to use upload image in the custom field.So in here i’m going to explain all how to use media uploader in your wordpress settings page. How do you find specific shortcode from the wordpress page or post contents? For a example if you are using “gallery” shortcode, you want to check that code if exist or not for some modifications.I wanted this for gallery shortcode if exist for some gallery width changes.So I found some codes and I have improved php codes and implementing here to you. In the wordpress woocommerce web site’s contains various featured products and sometimes we want to get the featured products without any plugins.For a example we want to get featured products to create featured slider.So I’m going to tell you have to get woocommerce featured products without any plugins and grammatically. Custom Post Types are a new set of administrative options appearing along with the default post types such as Posts, Pages, Attachments etc. 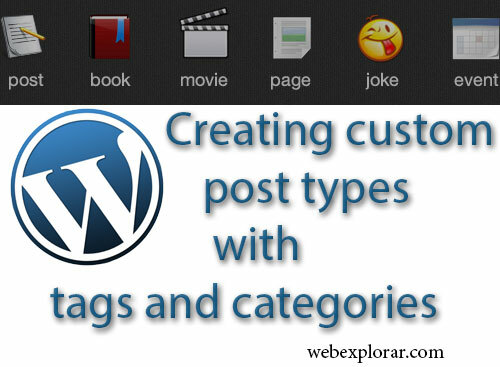 A Custom Post Type can store any type of information. It has a editor, media uploader and uses the existing WordPress table structure for ease in data management. This post is explaining creating wordpress custom meta boxes/meta data in easy,secure & proper way.A post meta box is a draggable box shown on the post adding/editing page. Its purpose is to allow the user to enter information in addition to the main post content. How to check and get recent post 3 in wordpress? On another way it’s calling exclude posts.I’m going to explain this in 2 methods.First method is getting first 3 posts into an array. When we’re going to display the posts, checking current post ID if exist in that array. If exist continue the loop.If not exist then display the posts.Other method is passing parameter “offset”.